Great new for players from Denmark. Vera & John now has a full licence for your country. Well, first it means that they are now able to offer all games, not just selections, which is already a huge improvement. But there is more. Because of the full licence, they can now create even better promotions, better player retention and other great promotions, especially for Danish players. Vera & John already created a custom promotion for all new Danish players. 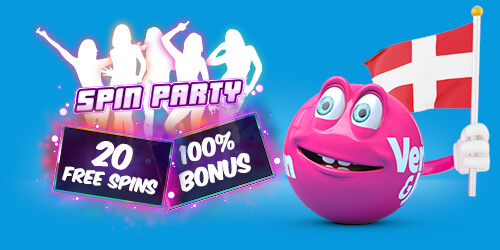 First all new registering Danish players will receive 20 no deposit free spins on Spin Party by Play’n Go. And after this you can claim a 100% first deposit bonus up to 500 DKK. Vera & John is one the best known, most respected and trusted online casinos. With games from NetEnt, Microgaming, Play’n Go, Williams Interactive and more. Vera & John also offers a great points system. You earn points by playing and these points can be traded in for cash, free spins, bonuses and more. So if you are Danish and want to play at a fully licensed, trusted NetEnt casino, visit Vera & John now and claim your 20 no deposit free spins and a lot more.